Clarksville, TN – The 2015 District 10-AAA Girls Basketball tournament tipped off Thursday night and the #4 West Creek Lady Coyotes (12-12) hosted the #5 Northeast Lady Eagles (12-17). A scoreless second quarter condemned the Lady Eagles and let the hungry Lady Coyotes run away with a 66-40 victory. The Lady Coyotes did not play like a team that had lost three of their last four regular season games. Instead, they played one of their best games of the season. The Lady Coyotes scored their most points all season. Tyisha Worthy scored a double-double and led eight Lady Coyote scorers, including three with double-digit points. West Creek Girl’s Basketball beats Northeast to advance in District Tournament. Worthy scored 19 points and grabbed 13 rebounds. Ariana Prather scored 16 with several assists and Deja Walls almost scored a double-double with 14 points and eight boards. Both teams opened the game with an offensive flurry. Three, 3-point shots helped the Lady Eagles outscore the Lady Coyotes 17 -14 in the first quarter. However, the Lady Eagles small lead evaporated as they shot 0-for-7 from the field in the second quarter. A 12-0 run gave the Lady Coyotes a 26-17 lead at halftime. The Lady Eagles shooting woes continued in the third quarter. They shot 3-of-17 from the field and 1-of-5 from the free throw line. In addition to struggling offensively, the Lady Eagles did not have an answer for Worthy in the third quarter. Worthy dominated the paint, scoring 10 of the Lady Coyotes 17 third quarter points. In the fourth, the Lady Eagles generated some offense primarily from behind the 3-point arc and the free throw line, but still failed to stop the well executed Lady Coyote’s offense. Prather drove to the basket constantly in the fourth quarter. When she was not scoring, she was making assists to Walls who scored eight points that quarter. The closest the Lady Eagles got to the Lady Coyotes was when Sepe Moore made a 3-pointer at the end of an 8-1 run to make the score 34-50. 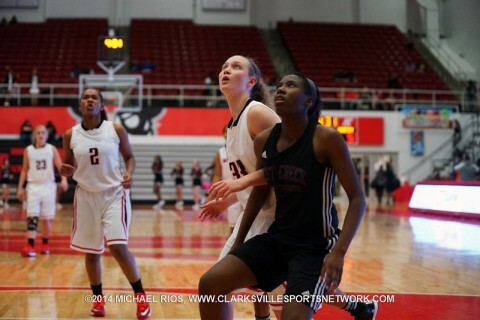 Moore was the Lady Eagles leading scorer with 12 points. Jazzmyn Simpson scored 10 and Michelle Donner added seven points. With the win, the Lady Coyotes advance to play the top seeded Rossview Lady Hawks at Kenwood High school in the District 10-AAA Tournament Semifinals Saturday, February 14th. Tyisha Worthy 19, Ariana Prather 16, Deja Walls 14, Madison Kurtz 7, Shayla Smith 4, Meah Hayes 2, Leandra Martinez 2, Kiaja McCabe 2. Sepe Moore 12, Jazzmyn Simpson 10, Michelle Donner 7, Nataszja Freeman 6, Essence Brown 2, Sh’Niya Horn 2, J.K. Spenn-Walker 1. Marlon Scott is a freelance journalist and writer. He graduated from Austin Peay State University in 2011 with a B.S. in Communications, majoring in Communication Arts with a concentration in print and web journalism. His writing career began as a sports writer for The All State, the APSU student newspaper, in 2006. He continued working for the paper until his graduation, serving in various positions including Sports Editor and Editor-in-Chief. In 2010, Scott contributed stories and photographs as well as designed and served as Editor-in-Chief for the monograph, Civic Art of Clarksville: The stories behind the pieces. Scott has also produced 60 stories for The Leaf Chronicle, the local newspaper of Clarksville, TN. 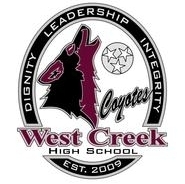 West Creek Lady Coyotes Win District 10-AAA Tournament Consolation Game.